Commentary: American Jews always believed the U.S. was exceptional. We were wrong. 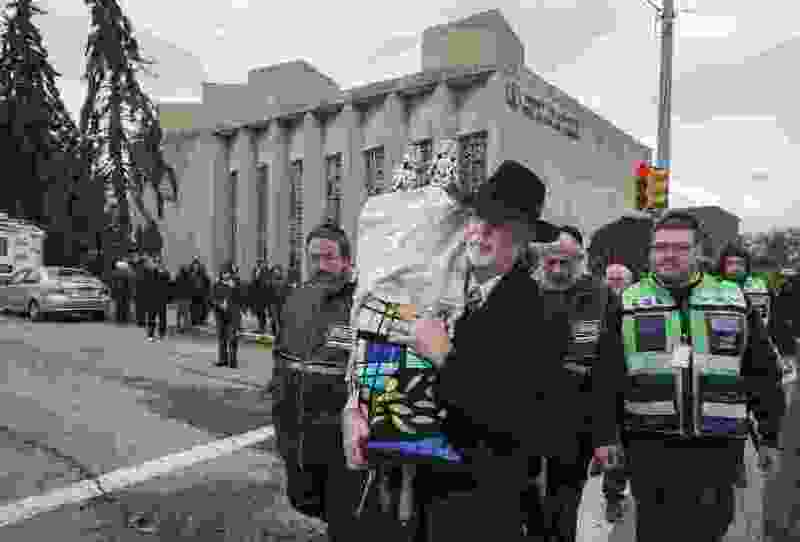 (Charles Fox/The Philadelphia Inquirer via AP, File) In this Oct. 29, 2018, file photo, Rabbi Jeffrey Myers, center, of Tree of Life synagogue, carries their Torah to be stored elsewhere in Pittsburgh. A team of rabbis and volunteers had gone into the Tree of Life synagogue to gather up blood and other remains from the victims of the shooting rampage, in keeping with Jewish law that says the entire body must be buried. I am a historian of American Jews. My morning last Saturday began with a bar mitzvah at our synagogue in Philadelphia; an hour into it, I left with my son to take him to a squash lesson at a private club. In my profession, we call this “the American-Jewish synthesis”: the ability to be Jewish and American all at once. Historians like me have spent decades explaining how and why Jews have been able to achieve this. Then I saw the news of the Tree of Life shooting in Pittsburgh. In my unfurling of emotions — including visceral anxiety about the safety of my daughter, whom I had left at synagogue — I confronted a notion that my training as an American Jewish historian had not equipped me to understand. In fact, it had done the opposite: It had allowed me to believe that the United States was an exceptional place for Jews. The American Jewish story as written and taught by historians like me has been one of progress, of steadily inching past old dangers to success in a new land. Sixty percent of Jews in America have completed college or graduate school. A larger share of Jews than of any other religious group earns incomes over $100,000. Jews can feel at home in America more easily than we could anywhere else in the history of the world. What I’d never truly contemplated was whether this story of American Jewish exceptionalism can last. From an early time, Jews have wanted to believe that America is different from other places. In the famous correspondence between George Washington and the congregants at a Newport, Rhode Island, synagogue, American Jews supplied the first president with the language to explain why Enlightenment hopes could become reality in the United States: the government “to bigotry gives no sanction, to persecution no assistance,” they wrote the president, and he echoed those words back to them. Throughout the 19th century, even as Jews in the United States faced prejudice — bans on their ability to hold public office, official expulsion orders and myriad forms of social exclusion — they continued to voice their faith that America was a better place than others where Jews had lived. Political and economic restrictions, including punishing communal taxes extracted in exchange for the right to conduct Jewish life, had bedeviled Jews in many European countries. Here, Jews could build synagogues and even get tax exemptions for them, just as churches did, or incorporate voluntary associations legally and participate in America’s expanding civic life. When a swell of Jewish immigrants arrived from Eastern Europe later that century, they learned to see the United States as “The Promised Land” (the title of a famous immigrant autobiography), despite rising nativism. Economic opportunity, paired with legal protections, fueled Jews’ patriotism. Although many immigrants pined for the homes and families they had left behind, they embraced America, enrolling in classes to learn how to speak, cook and dress like Americans. And when the United States entered World War I, Jews volunteered to fight and die for their new country. In the 1920s and ’30s, Congress voted to stanch the flow of immigrants from nations with populations classified as undesirable. But even as the nations from which millions of Jews had emigrated to America were targeted in restrictive immigration policies and false theories about Jews’ conspiracies for global control and their desires to hold power for their own gain circulated widely, American Jews still kept faith in the unique nature of their “golden land.” Jews voted in droves for Franklin Roosevelt, supporting the New Deal Democrat with growing zeal each of the four times he ran for president. They saw in FDR’s politics a kind of liberalism that would balance the rights of individuals with protections for groups. Despite pro-Nazi rallies and coordinated acts of anti-Semitism — most infamously a 1939 rally that filled Madison Square Garden — American Jews continued to see an exceptional future for themselves and their children in the United States. Nothing confirmed the rightness of American Jews’ bet more than the destruction of European Jewry. All of them, from the secular to the devout and the radical to the assimilationist, had to confront the “accident of geography,” as midcentury Jewish intellectual Irving Howe put it, that had saved them from the gas chambers. Their belief in the exceptional nature of the United States seemed provident: Here, unlike in other countries, they could use political, economic and intellectual tools to protect themselves. After World War II, Jews helped create the language, laws and institutions that would form the infrastructure of American campaigns against prejudice of all kinds, not just anti-Semitism. Through radio and television ads, social research and political activism, American Jews played a significant role in crafting the rhetoric of tolerance and social harmony. In doing so, they trained Americans to see anti-Semitism as unacceptable and made the case for the rights of minorities more broadly in the United States. In the 1950s, Jewish leaders, from rabbis to intellectuals to the heads of prominent institutions, argued that Jews would be only as accepted as the least-accepted people in America. Yet by the 1960s and ’70s, many Jews acknowledged that they had more power than African-Americans and other racial minority groups; Jews could often be accepted even if these groups were not. And Jews disproportionately joined civil rights marches and fought legal battles to help these groups (though some also asked why African Americans were not succeeding as Jews had). A high level of engagement with American politics demonstrated that most Jews continued to believe that, just as the United States had lived up to its promise for them, it could, if pushed properly, do so for others. However much further America had to go, if it had avoided the anti-Semitic impulses that had led so many other nations into tragic historical moments, this surely was a sign that progress could be made. Ironically, that very faith would eventually pose a fundamental question about Jewish endurance: Would Jews achieve so much progress in the United States that they would stop being Jewish? By the 1970s, Jewish leaders had started to identify the impediments to Jewish life as internal, not external. They worried that America offered so much acceptance that young Jews would have no use for their history and heritage. At a 1971 conference, a prominent New York rabbi and communal leader predicted forebodingly (and hyperbolically), “We are likely to lose more Jews through intermarriage and assimilation in the decades to come than we have already lost through the pogrom and the Holocaust.” The language of Jewish survival and continuity became the rallying cry of an American Jewry worried about its undoing through its success. By the early 2000s, this was the face of American Jewish exceptionalism: well-funded trips to Israel to allow young Jews to discover or recover their birthright; endowed Jewish studies programs and gleaming new college Hillel buildings supported by funders who wanted Jews to find other Jews on campus; and countless surveys of Jewish communities to measure whether Jews were still Jewish. By the new millennium, non-Jewish American politicians seemed as intent — sometimes more intent — upon denouncing perceived anti-Semitism as were American Jews themselves. Now I wonder if I will look back on those innocent minutes last Saturday between the bar mitzvah and the squash club as the last of an illusion, one that should never have lasted this long. Impossible will be our celebrations of “Only in America,” the name of a standing exhibit at the National Museum of American Jewish History in Philadelphia. The treatment of American Jews is not a bellwether of overall American progress — instead, it may be one of the most exceptional things about the United States. It is not the exception that proves the rule; it is just an exception and, perhaps, an unreliable one. The problem with the deep-seated faith Jews have maintained in America is that it has propped up a broader vision of American exceptionalism and occluded the damages of exceptionalist thinking. As a description of American Jewish life, exceptionalism has brushed under the rug the exclusion and discrimination Jews have faced. Worse, it has stood in the way of an honest reckoning with the violent possibilities that have long simmered under the surface of its claims. The Pittsburgh shooting, on top of the more open expressions of anti-Semitism in the past few years, makes that brutally clear. For American Jews, that reckoning will be painful. It will challenge the very basis of our acceptance in this country and make us ask whether the opportunities and privileges we gained came not because America held particular promise for Jews, but rather because it withheld that promise in so many ways to so many other people. Should we ever have believed in American exceptionalism, even just for Jews, when all around us was evidence of the limitations and ravages of that exceptionalism? President Donald Trump displays how easily exceptionalism can become a weapon for exclusion; this is the very purpose of “Make America Great Again.” The president legitimizes white supremacy as one of “both sides” of American life. He declares himself to be a nationalist without bothering to distinguish between his nationalism and the dark history of xenophobic and genocidal nationalism. He routinely gives cover to those who abuse vulnerable populations — trans people, refugees, immigrants, Muslims, people of color, children and women — by telling his followers that they are the victims. In all cases, what he calls the “greatness” of this country is its ability to exclude whole classes of people as unfit and undesirable for its blessings. Trump renders American exceptionalism irredeemable. Whatever was good or pure about the desire to pronounce our country different or special is, in his framing, explicitly steeped in violence, aggression and hatred. For some Americans, the pain of exceptionalism — its fundamental exclusions — has always been clear. For Jews, it has not, but now it must be. Faith in American exceptionalism, for Jews or for anyone else, will not save us. I fear that faith is destroying us. But we can look anew at our history, as Jews and as Americans. When we release ourselves from the hold of exceptionalism, we will have to search for new ways to explain why America has been so good to Jews in so many ways. And we will have to confront the fact that the Jewish story in the United States is still being written, and progress is not its inevitable conclusion. Perhaps free from exceptionalism, we may discover a new path toward justice and equality for all, without exception. Lila Corwin Berman is a professor of history and the director of the Feinstein Center for American Jewish History at Temple University.